When you need to manage multiple projects it is useful to combine their project plans in one by creating a project group. Such a project group consists of two or more sub-projects. They can either belong to one big project or the completion of some activities etc. in one project are the prerequisite to being able to complete activities etc. in the other one. It can also happen, that several different departments need to liaise on the same project. Then it can be useful to break the whole project down into smaller ones for each department and link these project plans to create a project group. HINWEIS In order to be able to create project groups, you need to have the permissions to edit projects and to edit planning, either in your user based permissions or in your role based permissions. If you only have reading permissions for projects, you cannot create project groups. You can change the user and role-based permission in the InLoox options (requires admin permissions). 1. Click in the tab Settings on Project Group. 2. 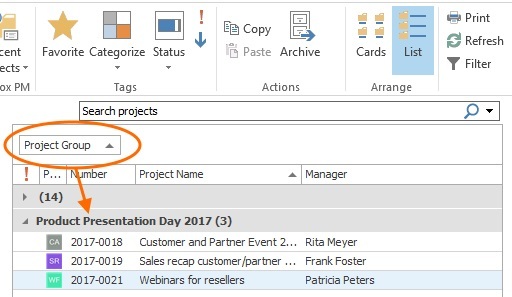 On the right hand side, select the project you want to add to your project from the side panel by clicking on the add-symbol . Or click on Add Selected Project in the tab Project group. Or drag the selected project from the list down into the grey box. 3. 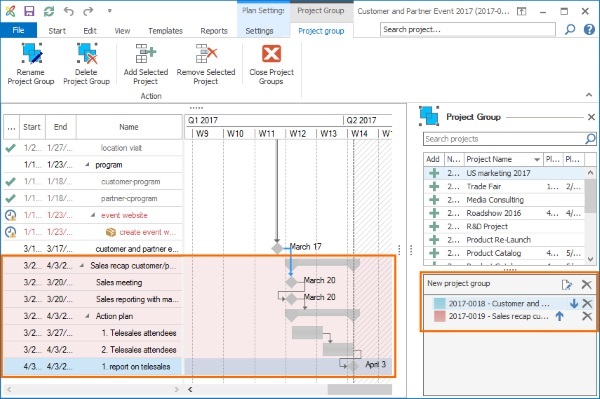 Now, you see the added sub-project in the Gantt-chart as well as in the grey box New Project Group in the side panel on the right. HINWEIS If you add a sub-project for which you do not have editing permissions, you will only see a bar with the sub-project’s name on it. You won’t be able to see the individual planning elements and cannot edit the sub-project! Or click on the symbol next to New Project Group in the side panel and enter the new name of the project group. 5. Now, you establish the dependency between the two projects. The dependency between different projects in a project group is blue, so you can distinguish it from the dependencies within a project, which are grey. Now, you can edit your project plan as usual. Changes to each of the project group’s sub-project plans are adopted when you save and close the project plan. You can manage the user and role based permissions in the InLoox Options. Use the arrows next to the sub-projects in the project group in the side panel, and click e.g. on to move it up. For better visual distinction, you can select different colors for individual projects in your project group. All planning elements of a project will then be highlight in the selected color. 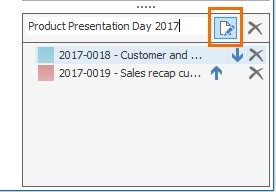 Click on the colored box next to the project in your project group in the side panel. Then choose a color from the drop-down menu. 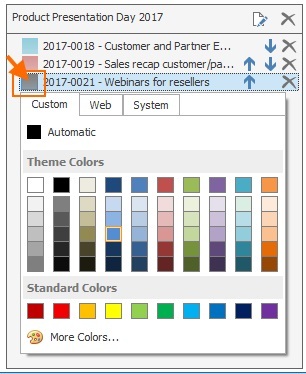 HINWEIS If you choose a color for your original project, then this color will be displayed when you open the Gantt-chart of the added project but not in the original project’s Gantt-chart. 1. Click on Projects in the ribbon and then click on List in the tab Start. 2. Now, add the column Project Group to your list. 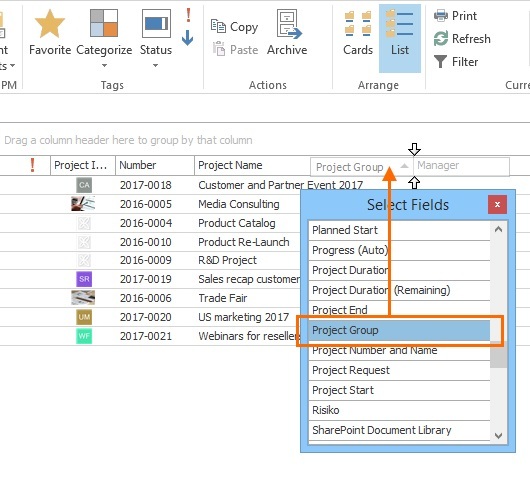 Right-click onto the project list and click on Select Fields in the context menu. 3. 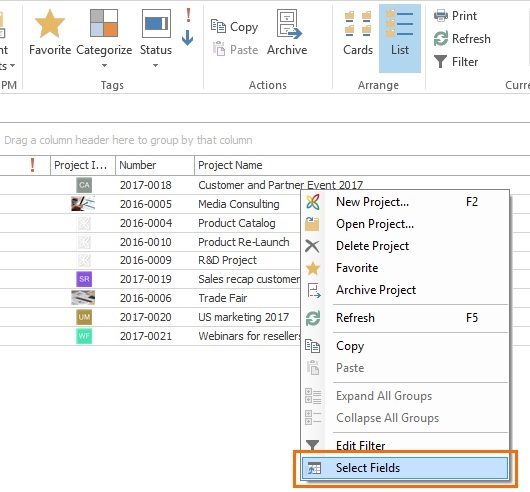 Drag the field Project Group into the project list wherever you want to place the column. 4. 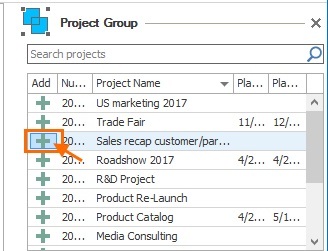 If you want to sort the list according to project groups, drag the column Project Group up onto the area above the list. 5. Now, you see the various project groups in the list. 1. In the side panel, click on next to the project you want to remove. 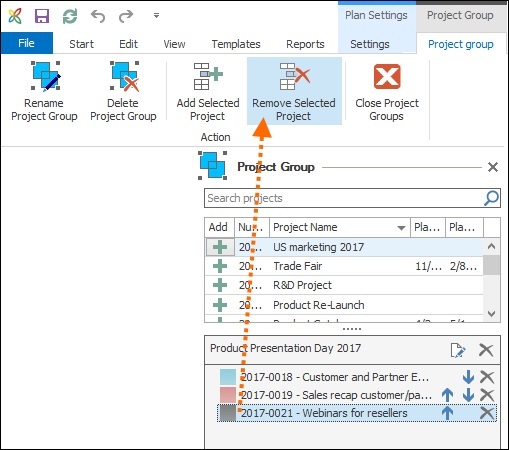 Or click on the sub-project you want to remove to mark it, then click on Remove Selected Project in the ribbon in the tab Project Group. 2. InLoox will ask you, if you are sure to remove the selected sub-project from the project group. Confirm by clicking Yes. HINWEIS Once you remove a sub-project from the project group, it is no longer available for selection in the project list in the side panel. If you want to add the removed project again, please close the project and reopen it. All projects are again available for selection in the side panel. WICHTIG If you remove the original project to which you have added sub-projects, InLoox will warn you that once you remove it, you will no longer be able to access the project group from this project. 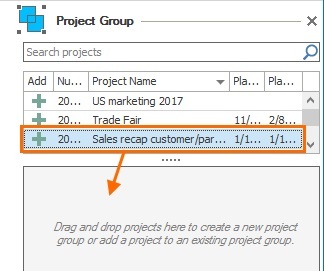 If you want to delete the whole project group, simply click on next to project group’s name in the side panel. Or click on Delete Project Group in the ribbon in the tab Project Group. InLoox will ask you again, if you really want to delete the whole project group. Confirm by clicking Yes. The project group will be removed and the sub-projects no longer belong to it. HINWEIS Each sub-project is still available. InLoox does not delete sub-projects when you delete a project group. Project groups: Multi-project management with dependencies between projects • Copyright 1999-2019 © InLoox, Inc. All rights reserved.